Religion of peace, brought to you by Allah the merciful, yup. It's not immediately clear how a book full of allegory can be "A book free of doubt (2:1)"
I used to work as a nurse in a psychiatric crisis ward in Florida, where the county sheriffs deputies would bring people who went off their nuts, and we'd medicate them until they were stabilized. 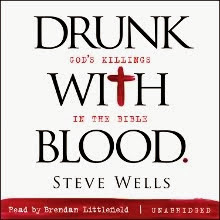 Listening to the religiously fixated ones rant their hatred and desire to kill, I could see that there's something in the nature of God delusions that infiltrates the human brain like a computer virus does a hard drive. Each has a flaw in the control system that lets a dysfunctional thing take over. It was Christ-based crazies I dealt with there. But every time I read about the Koran -- tried to read it a few times myself, but it was so stultifying that I couldn't get through more than a few pages -- I can see why it would attract delusional people. Especially since so many Muslim cultures are as holy book-focused as Christians were during the Middle Ages. Religion -- it's a thought-virus for the hard-drive of your brain. Do all those Fundamentalist websites and services that advertise on your page know what it's about !? Do you ever feel guilty, lol ?! @skansta Religious ads appear on every atheist and religious site that has ads. I don't think it's a big issue for the SAB/Q/BOM author. I'd not noticed them before, lol !